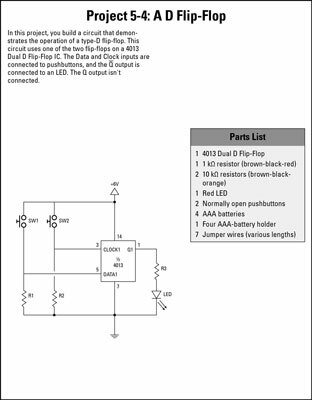 A D flip-flop electronic circuit has just one input in addition to the CLOCK input. This input is called the DATA input. When the clock is triggered, the Q output is matched to the DATA input. Thus, if the DATA input is HIGH, the Q output goes HIGH, and if the DATA input is LOW, the Q output goes LOW. 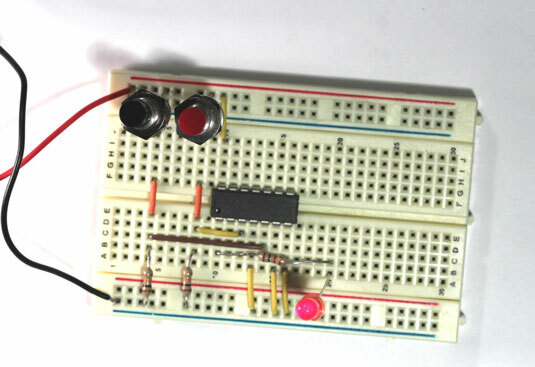 This project shows you how to use a 4013 IC to create a basic D flip-flop. 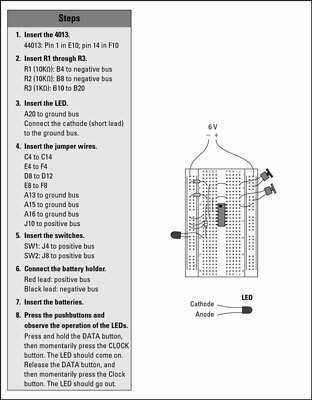 This circuit works much the same as the D-type latch. However, it requires only one IC rather than two, and the wiring is much simpler. That’s because the engineers who designed the 4013 IC crammed all the wiring between the individual NAND gates in the IC, so you don’t have to wire the gates together on the breadboard. Instead, all you have to do is hook up the inputs and the outputs and watch the circuit work.